Do you laser? In the world of packaging, less is more. Technical Theme: key technical developments from across the packaging machinery industry. A TWM report. Following PCMC’s acquisition of flexible packaging machinery manufacturer Graphbury Machines in September, PCMC product & applications leader Carl DuCharme discusses its latest technical innovations. How can you use less labour and fewer materials and yet provide a world-class package with greater product protection? How can you impact the environment less? What are those game-changing innovations that help you lead the way? • Efficiency: The key is first-pass success: the ability to produce an optimal product or outcome with minimal waste and rework. When applying ink, adhesive, lotion, or other solution during a converting operation, it is critical for a consistent application process to employ tooling that is in a condition as similar as possible to when it was new. When looking at keeping printing and solution application sleeve and roll tooling inventory clean, many times it takes several passes/cycles for cleaning equipment to achieve its best clean, wasting precious production time and cost. Meridian laser cleaning technology continues to advance and currently provides printers and converters a solution for one-pass cleaning that achieves like-new surface condition at unprecedented speeds, many times increasing efficiency 300% or more. • Environment: Every producer has environmental consideration top-of-mind. Converting creates waste, so the goal is to minimize the impact of every portion of the process. PCMC Meridian laser cleaning uses no water. Nothing goes down the drain. It does not create a dusty environment. It requires no air supply. It uses very little energy. It is designed to make the process of sleeve and roll cleaning friendly to the environment. • Safety: Operator safety and well-being are of utmost concern as well. Avoiding injury and reducing fatigue help to make each day more fulfilling. The PCMC Meridian is designed to allow easy access to all parts of the machine without compromising operator safety. Additionally, the automatic cleaning cycle, flip-up cleaning area access door, easy-to-use operator interface, and large cleaning area access opening offer enhanced ergonomics to the operator. Its design also complies with international safety regulations. • Effectiveness: Various process can clean tooling, but do they clean effectively? Are they able to achieve like-new condition of surface engravings? Many types of sleeve and roll cleaning equipment come with claims of fast cycle times that fail to mention sub-optimal cleaning effectiveness, requiring multiple passes and most times ending up with a product that is not thoroughly cleaned. The PCMC Meridian deep cleans engravings of any line screen thoroughly in a single pass. In many cases, after-cleaning cell volume measurements match almost exactly the original cell volume engraving. This relieves stress from production processes by allowing consistent output from tooling without having to adjust solution formulas or equipment settings. The Meridian effectively removes inks, adhesives, glazes, stiffeners, coatings, and varnishes from ceramic and chrome surfaces. Using auto-focus technology, it optimizes the laser’s energy in order to pulverize any residue deposited on the engraved surface. Maintaining tooling inventory incurs cost, including the cost to clean, the cost to repair or replace tooling damaged during the cleaning process, the cost of supplies needed for cleaning, and the cost to maintain cleaning equipment. What if each of these costs was significantly reduced? What would that mean to your profits? There is also a cost to having tooling that cannot be cleaned. Is your converting process stable and consistent if your tooling is unevenly cleaned? How much time is spent achieving process baseline by adjusting solution formulas and equipment settings? Downtime is expensive. The PCMC Meridian requires almost no maintenance and virtually no spare parts. It does not cause roll or sleeve surface damage or wear during cleaning and does not increase surface temperature. It requires no chemicals, no cleaning media, no air supply, no water supply, no personal protective equipment, and no other supplies. Its design is continually advancing, and cleaning cycle times will continue to fall as a result. PCMC Meridian laser technology is what’s next in the world of roll and sleeve cleaning. This is just the beginning of its story, and it will continue to offer advantages to printers and converters into the future. PCMC continues to research additional developments using laser technology that will surely enhance other areas of the converting operation as well. 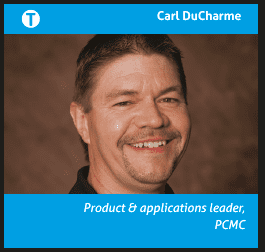 This article was written for TWM by Carl DuCharme, PCMC product & applications leader. Share the post "Do you laser? In the world of packaging, less is more."